On the 12th (Tue), look for all kinds of wild species at Wildlife Areas. For photos, reviews, maps, and other tourist information, you can read our Kailua-Kona day trip planning website . San Francisco to Kailua-Kona is an approximately 8.5-hour combination of subway and flight. You can also do a combination of train and flight; or do a combination of flight and bus. You'll gain 2 hours traveling from San Francisco to Kailua-Kona due to the time zone difference. 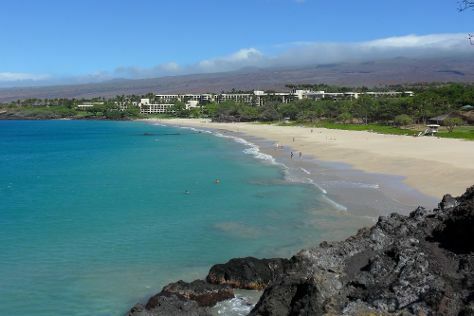 In June, Kailua-Kona is a bit warmer than San Francisco - with highs of 84°F and lows of 74°F. Cap off your sightseeing on the 14th (Thu) early enough to travel to Waimea. Start off your visit on the 14th (Thu): explore the striking landscape of Puukohola National Historic Park and then enjoy the sand and surf at Hapuna Beach State Recreation Area. For photos, reviews, maps, and more tourist information, go to the Waimea trip planner . Getting from Kailua-Kona to Waimea by car takes about an hour. While traveling from Kailua-Kona, expect slightly colder days and colder nights in Waimea, ranging from highs of 71°F to lows of 48°F. Finish your sightseeing early on the 14th (Thu) to allow enough time to travel to Hilo. One of the island of Hawaii's major towns, Hilo contains a mix of Asian and Polynesian cultures and is known for its proximity to a national park encompassing two active volcanoes. Start off your visit on the 15th (Fri): savor the flavors at Hilo Farmers Market, take in nature's colorful creations at Liliuokalani Gardens, then shop like a local with Volcano Art Center, then see the interesting displays at Jagger Museum, and finally hike along Kilauea Iki Trailhead. For reviews, where to stay, other places to visit, and tourist information, go to the Hilo planner . Traveling by car from Waimea to Hilo takes 1.5 hours. Expect somewhat warmer temperatures when traveling from Waimea in June; daily highs in Hilo reach 82°F and lows reach 68°F. On the 16th (Sat), you'll have the morning to explore before heading back home.